** Hydrogen bond is represented by a dashed or dotted line. (1) Only O, N and F which have very high electronegativity and small atomic size, are capable of forming hydrogen bonds. (2) Hydrogen bond is longer and much weaker than a normal covalent bond. Hydrogen bond energy is less than 10 kcal/mole, while that of covalent bond is about 120 kcal/mole. (3) Hydrogen bonding results in long chains or clusters of a large number of ‘associated’ molecules like many tiny magnets. 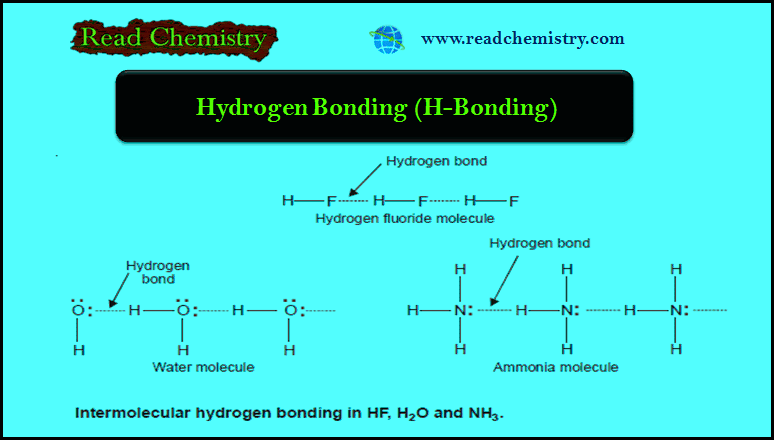 (4) Like a covalent bond, hydrogen bond has a preferred bonding direction. This is attributed to the fact that hydrogen bonding occurs through p orbitals which contain the lone pair of electrons on X atom. This implies that the atoms X–H...X will be in a straight line. ** The molecule must contain an atom of high electronegativity such as F, O or N bonded to hydrogen atom by a covalent bond. ** The examples are HF, H2O and NH3. ** The electronegative atom attached to H-atom by a covalent bond should be quite small. Smaller the size of the atom, greater will be the attraction for the bonded electron pair. ** In other words, the polarity of the bond between H atom and electronegative atom should be high. This results in the formation of stronger hydrogen bonding. ** For example, N and Cl both have 3.0 electronegativity. But hydrogen bonding is effective in NH3 in comparison to that in HCl. It is due to smaller size of N atom than Cl atom. ** When hydrogen bonding occurs between different molecules of the same compound as in HF, H2O and NH3, it is called Intermolecular hydrogen bonding. ** If the hydrogen bonding takes place within single molecule as in 2-nitrophenol, it is referred to as Intramolecular hydrogen bonding. ** The molecule of HF contains the strongest polar bond, the electronegativity of F being the highest of all elements. ** Therefore, hydrogen fluoride crystals contain infinitely long chains of H–F molecules in which H is covalently bonded to one F and hydrogen bonded to another F.
** The chains possess a zig-zag structure which occurs through p orbitals containing the lone electron pair on F atom. ** In H2O molecule, two hydrogen atoms are covalently bonded to the highly electronegative O atom. ** Each O atom still has an unshared electron pair which leads to hydrogen bonding with other water molecules. Thus liquid water, in fact, is made of clusters of a large number of molecules. ** In NH3 molecules, there are three H atoms covalently bonded to the highly electronegative N atom. ** Each H atom can hydrogen bond to N atom of other molecules. 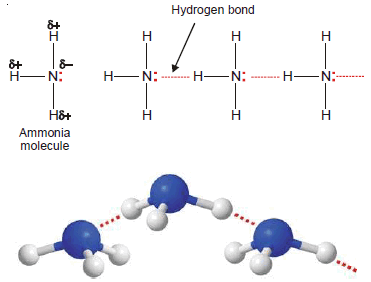 Here hydrogen bonding takes place within the molecule itself as O–H and N–H bonds are a part of the same one molecule. 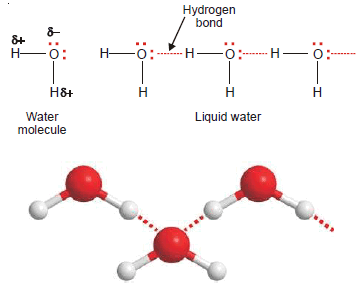 ** This type of hydrogen bonding results in the formation of associated molecules. Generally speaking, the substances with intermolecular hydrogen bonding have high melting points, boiling points, viscosity, surface tension etc. ** This type of hydrogen bonding is formed between the hydrogen atom and the electronegative atom present within the same molecule. It results in the cyclisation of the molecule. ** Molecules exist as discrete units and not in associated form. 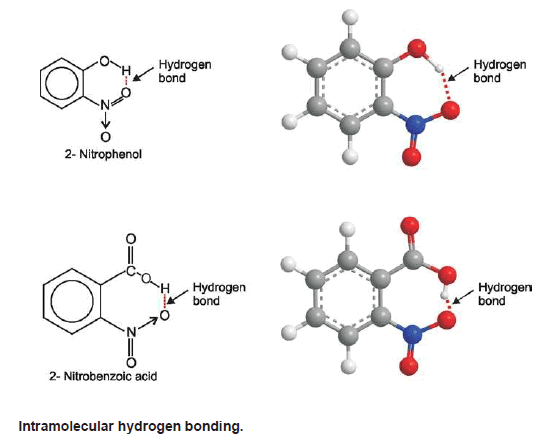 Hence intramolecular hydrogen bonding has no effect on physical properties like melting point, boiling point, viscosity, surface tension, solubility etc. ** The compounds in which molecules are joined to one another by hydrogen bonds, have unusually high boiling and melting points. This is because here relatively more energy is required to separate the molecules as they enter the gaseous state or the liquid state. ** Thus the hydrides of fluorine (HF), oxygen (H2O) and nitrogen (NH3) have abnormally high boiling and melting points compared to other hydrides of the same group which form no hydrogen bonds. 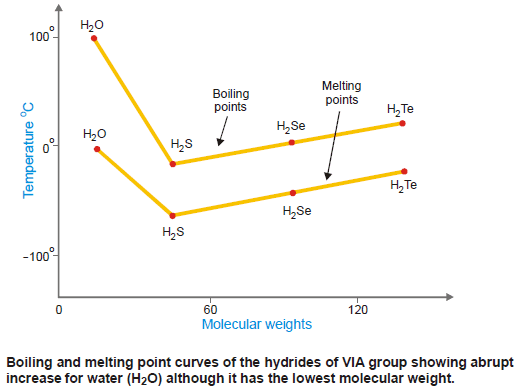 ** In the following Figure are shown the boiling points and melting points of the hydrides of VIA group elements plotted against molecular weights. ** It will be noticed that there is a trend of decrease of boiling and melting points with decrease of molecular weight from H2Te to H2S. But there is a sharp increase in case of water (H2O), although it has the smallest molecular weight. The reason is that the molecules of water are ‘associated’ by hydrogen bonds between them, while H2Te, H2Se and H2S exist as single molecules since they are incapable of forming hydrogen bonds. ** The unexpectedly high solubilities of some compounds containing O, N and F, such as NH3 and CH3OH in certain hydrogen containing solvents are due to hydrogen bonding. ** For example, ammonia (NH3) and methanol (CH3OH) are highly soluble in water as they form hydrogen bonds. ** As already stated, hydrogen bonds are directional and pretty strong to form three dimensional crystal lattice. ** For example, in an ice crystal the water molecules (H2O) are held together in a tetrahedral network and have the same crystal lattice as of diamond. This is so because the O atom in water has two covalent bonds and can form two hydrogen bonds. These are distributed in space like the four covalent bonds of carbon. The tetrahedral structural units are linked to other units through hydrogen bonds. ** Since there is enough empty space in its open lattice structure ice is lighter than water, while most other solids are heavier than the liquid form. (1) It dissolves many ionic compounds and polar organic compounds. 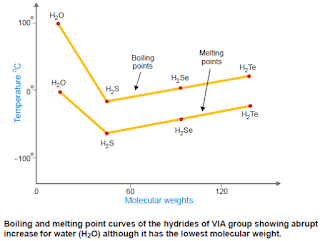 (4) high specific heat with melting point 273 K and boiling point 373 K.
** The structure of water is tetrahedral in nature. Each oxygen atom is linked to two H-atoms by covalent bonds and other two H-atoms by hydrogen bonding. ** In this solid state (Ice), this tetrahedral structure is packed resulting in open cage like structure with a number of vacant space. Hence in this structure the volume increases for a given mass of liquid water resulting in lesser density. Due to this reason ice floats on water. ** On melting ice, the hydrogen bonds break and water molecules occupy the vacant spaces. This results in decrease in volume and increase in density (d = m/v). 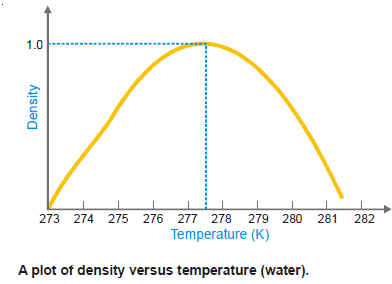 ** Hence density of water keeps on increasing when water is heated. This continues upto 277 K (4ºC).